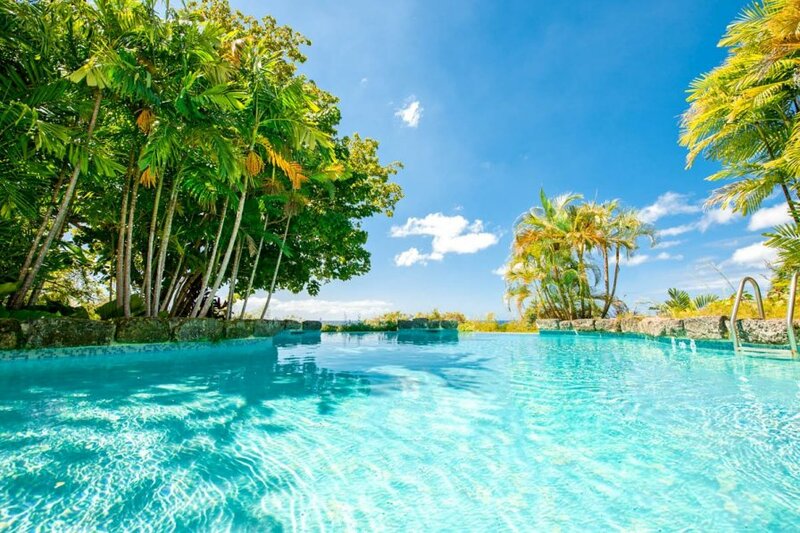 Villa Calypso is a home of unique character located on eight acres of landscaped grounds. The main house is constructed around a 17th century sugar mill and consists of three buildings connected by uncovered stairways. A cozy gazebo on the cliff side has sweeping views of the coastline, and the property has a ridge side infinity swimming pool with cabana and separate Jacuzzi located a short walk through the tropical gardens (about 100 yards) south of the main house. To the east of the main house has a tennis court, garden and orchard. Villa Calypso is the ideal choice for families - four bedrooms are located in the main house (one at the top of the mill) and two in the guest cottage (suitable for teenagers, children and nannies) on the grounds. The main house includes a spacious terrace linking an airy salon and a dining room for twelve. Upstairs, a verandah gives access to a circular sitting room and a master bedroom with large bathroom, dressing room, and private balcony, and to a charming circular double bedroom with bathroom en suite in the mill tower. The guest cottage adjoining the main house was designed to accomodate teenagers, children and nannies, and features two double bedrooms each with its own bathroom and private verandah. A further two double bedrooms, each with an en-suite bathroom are also close to the main house. The property includes a swimming pool with pool house and jacuzzi, a floodlit Villa Calypso sleeps twelve, is fully staffed and is maintained to meticulous standards. Our staff will do their upmost to ensure that your holiday is memorable. Bedroom 1 - Master (1st Floor): King size bed four-poster bed, En-suite with double vanity, combination sunken tub and shower, bidet, Dressing room, private balcony. Bedroom 2 - The Round Mill Room (2nd Floor): Double four-poster bed, En-suite with single vanities and shower. Bedroom 3 (1st Floor): 2 Twin beds, Connected to the Main House by an open stairway, En-suite with single vanities, tub and shower. Bedroom 4 (Ground Floor): 2 Twin beds, Connected to the Main House by an open stairway, En-suite with single vanities and shower. Bedroom 5: 2 Twin beds, En-suite with single vanities and shower. Bedroom 6: 2 Twin Beds, En-suite with single vanities and shower. - High Speed (ADSL) Internet access available for guests who bring their laptops. - 33 ft. x 19 ft. - shallow end 3 ft. - deep end 5.5 ft.
- Pool shower room with single vanity. - Six bedroom rental rates at Mullins Mill include use of the owners' Mastercraft 21 foot speedboat equipped for waterskiing and towing inflatable rides. (Please note the cost of oil and petrol are additional).